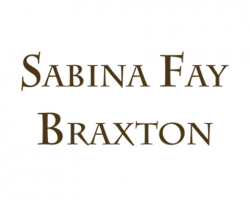 Sabina Fay Braxton, known for her exuberant extrapolations of ancient hand-printed textile techniques, has been creating fabrics for renowned couturiers, interior designers, and an array of discriminating private clients for over a decade. Ranging from such designers as Christian Lacroix, Valentino and Armani, to Alberto Pinto, Peter Marino and Juan Pablo Molyneux, her clientele also includes celebrities such as Catherine Deneuve, and Dumbledore himself from the Harry Potter films. International exhibitions in both Art Galleries and Tradeshows are held in Paris, Monaco, New York, Singapore and Moscow. Baroque in spirit and endowed with the adventurousness of a Mediaeval explorer, Braxton found a form of expression to convey her rich experiences and impressions. Her extraordinary use of colour, and the remarkable manner in which she transforms, cloth and design, is truly her trademark. These inimitable textiles are concocted and cultivated in her ateliers in Paris and in an ancient mill in Ireland. Braxton’s inclinations find their perfect medium in silk velvet, which affords a luminosity and suppleness of manipulation. The unusual printing technique applied is a personal variation on the mediaeval art of gaufrage. Braxton has baptized “Gilded Gaufrage”, a technique in which the pile is embossed by heated carved blocks, encrusted with metals and stained with inks that create a patinated, iridescent and luminous effect on the cloth that orthodox printing methods cannot achieve.